This entry was posted on Friday, October 16th, 2015 at 21:40	and is filed under Poetry, Writings, XML Poetry. You can follow any responses to this entry through the RSS 2.0 feed. You can leave a response, or trackback from your own site. I have never seen a poem written quite like this before. It’s pretty neat! I actually understood the poem that you’re trying to write. At first, I thought was this a mistake for all the code to be showing? Than I realized it was supposed to be there., Haha! Pretty clever, and I love it. 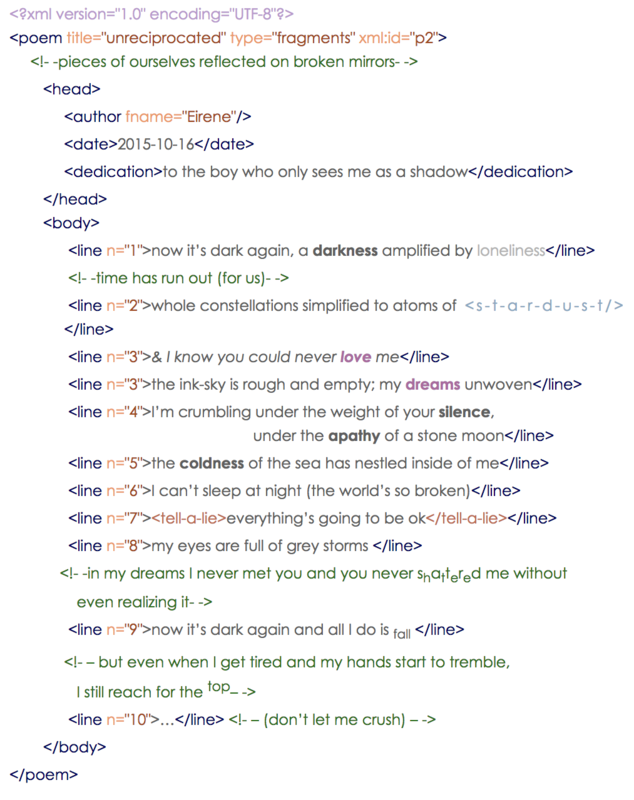 I normally don’t understand XML but the words without the code is beautiful. This is unique and something I like hugs The imagery and feelings were powerful and strong. I love this!